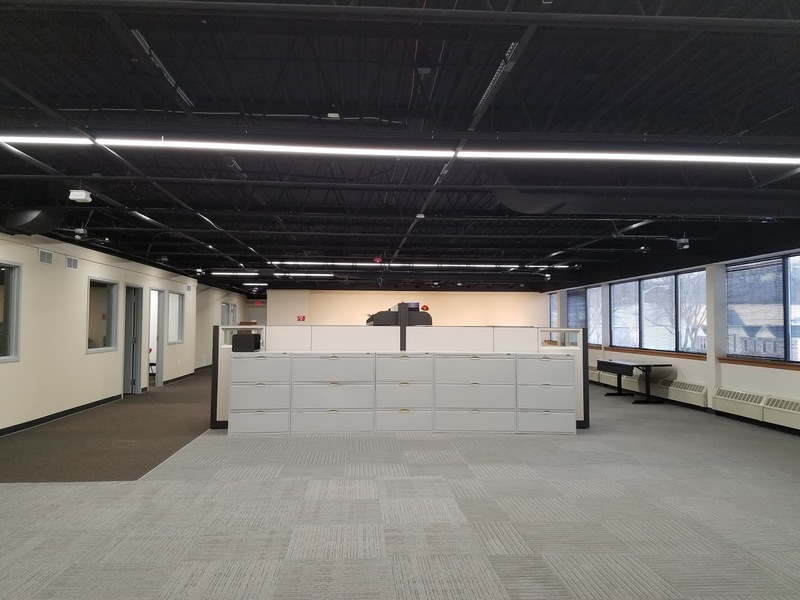 The existing space on the 2nd floor of this building was used as a plumbing and lighting showroom for a national supply chain. 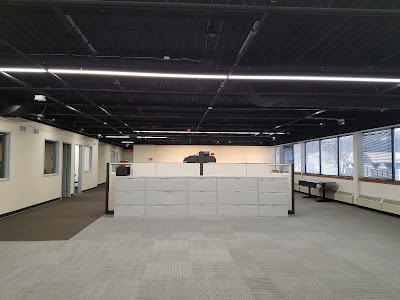 An open truss black ceiling existed, offering a chance to create a high volume space once the existing track and fixture display grids were removed. 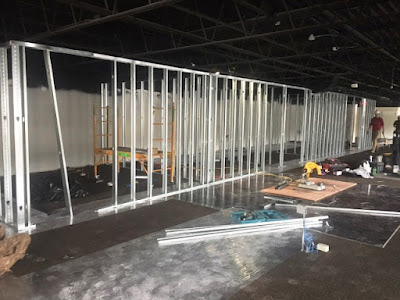 We decided to build out (6) individual offices on the east wall and create an open office environment in the main area utilizing the natural light from the west wall of windows. The individual offices gained a lay-in ceiling at 8 feet. The fixtures are the Lithonia BLT Volumetric LED in 2x2 and 1x4 sizes at 30 watts each. 0-10 volt dimming is accomplished by either a Lutron Maestro 0-10 volt dimmer/occupancy sensor, or Lutron Pico-controlled ceiling occupancy and daylight sensor products. The color temperature is a neutral 4000K. The linear lighting in the open office is the Finelite HP4 series, painted black with a satin lens. When on, the body disappears into the background of the ceiling, giving the appearance of the flat lens being suspended in thin air. At thirty six watts per four foot section, the LED product puts out as much light as a traditional fluorescent system at twice the wattage. The color temperature is a neutral 4000k as well. Continuous linear runs were tucked between the trusses to maintain the feeling of volume in the space. 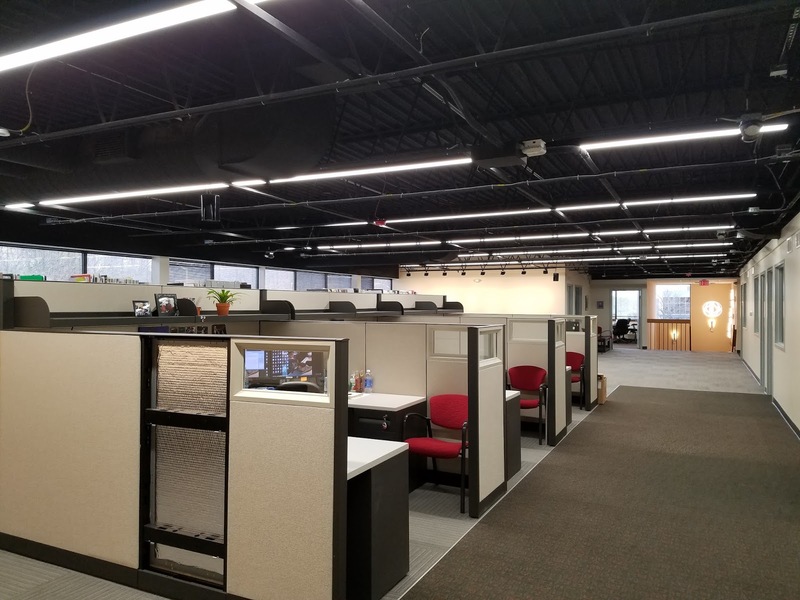 The extensive windows and natural daylight throughout all spaces required a control system of Lutron 0-10V PowPaks, Lutron wireless occupancy and daylight sensors, as well as localized Lutron wallbox dimming and Pico zone control. Using track heads re-purposed from the old showroom, feature walls are bathed in 3000K LED, which will highlight future artwork and project photos. 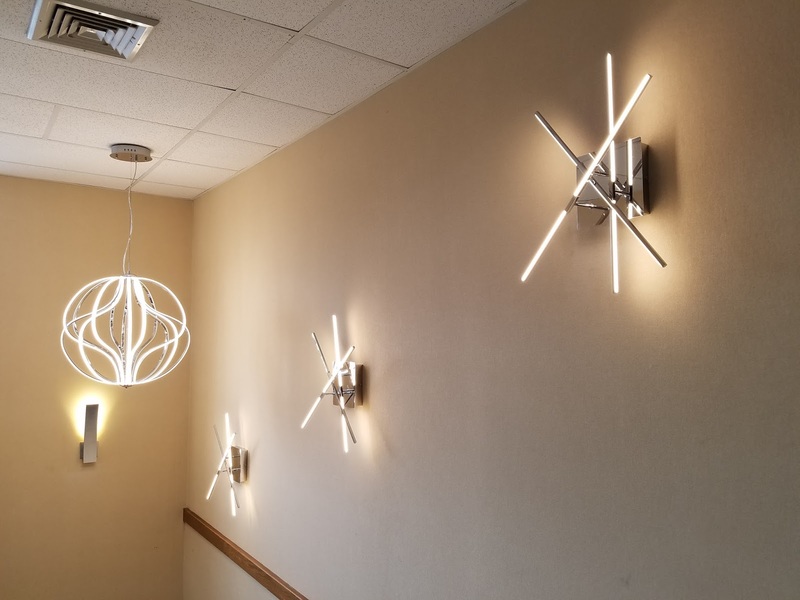 The main staircase is lit with the ET2 Aura LED chandelier, as well as the Kriss Kross and Alumilux series LED wall sconces. An Aladdin Lift allows us to drop the chandelier for dusting and cleaning.